Full Tilt Poker is a popular poker room with a European focus. Since 2014, its been a part of the Amaya Gaming Group. It is usually among the top 10 on PokerScout’s list of the poker rooms and networks with the most traffic to their cash game tables. When you sign-up with Full Tilt Poker you get a no deposit welcome package that consists of two Rush Poker tickets worth $2 each + six Jackpot Sit & Go tickets worth $1 each. 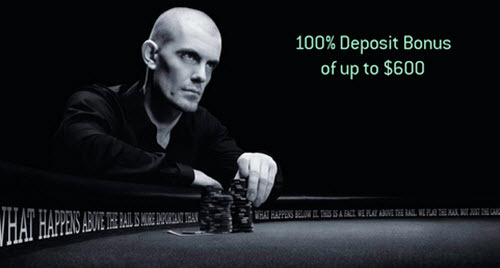 Your first deposit to Full Tilt Poker gives you a 100% match bonus up to $600. Full Tilt Poker do offer a fast poker variant, and it is called Rush Poker. Full Tilt Poker has en excellent selection of scheduled tournament and sit ‘g go tournaments. For the scheduled tournaments, the late registration feature makes it possible to join a tournament that has already started. Roughly four times a year, the big tournament event Full Tilt Online Poker Series (FTOPS) is held. This event is always followed by a MiniFTOPS that follows the same tournament schedule but with significantly lower buy-ins. Full Tilt Poker offers a wide range of tournament formats and tournament features, including multi-entry, double stack, super stack, double chance, triple chance, knockout bounty, shootout, add-on, rebuy, and cash-out. Looking for something quick? Full Tilt Poker offers both turbo tournaments and super turbo tournaments. When it comes to sit ‘n go tournaments, the selection at Full Tilt Poker is varied and includes interesting features such as S & G Matrix. You can work your way up through S & G Steps. Full Tilt Poker is not included in any poker network, which means that they can use their own proprietary poker software. They offer web browser play, as well as downloaded client play (for both Windows and Mac OS X). Full Tilt Poker has a mobile app for both Android and iOS. The app was named “Best Poker App” at the IGA Gaming Awards 2014. In the app, you can play for real-money or for free play-money. Full Tilt Poker is usually included in the lower end of the top-10 spots on PokerScout’s list over poker rooms and poker networks with the most traffic to their cash game tables. If you want really high traffic, there are other options that are more suitable than Full Tilt Poker, especially Poker Stars. Full Tilt Poker only offers email support. You can’t call or get help through live chat. The email address is support@fulltiltpoker.com. Examples of popular transaction methods that are accepted by Full Tilt Poker are Neteller, Skrill, VISA, MasterCard and Entropay. Since Full Tilt Poker and PokerStars have the same owner, you can easily transfer funds between a PokerStars account and a Full Tilt Poker account. Full Tilt Poker was launched in 2004. Full Tilt Poker was acquired by PokerStars parent company in 2012. In 2014, PokerStars parent company was acquired by Amaya.